Trove makes it as easy to read the newspapers of yesteryear as to read the newspapers of today. And there’s no paywall either. Through Trove we have easy access and insights into detailed accounts of Council and community meetings – who was there, what was said, and what issues were raised. Reading those newspapers motivates me to obsessive recording of local events that might otherwise pass by in a tweet or two and a facebook post – hard to search, fragments of a record. 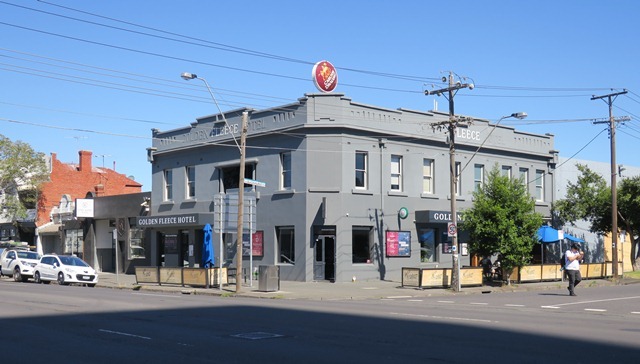 It was an election year in 1899 when local representative and Postmaster General Frederick Derham held a meeting of constituents at the Fountain Inn (now The Hack) in Port Melbourne. Derham was a managing director of the Swallow and Ariell biscuit business – a conservative in politics. The ‘spacious room was crowded to excess’. Derham spoke to his record: ‘he might not have succeeded in doing all he would fain have done on behalf of his constituency, but he had done all that constant and persistent effort could accomplish.’2 The Lagoon was the number one issue raised at that meeting. 2018 is an election year in Victoria. And that is why the recent Montague Community Forum attracted the presence of local member and Minister for many portfolios1 Martin Foley, Shadow Minister for Planning David Davis and Greens leader Dr Samantha Ratnam. The forum, one of a series, was convened by Trisha Avery, reluctant community activist. Early planning for Fishermans Bend seemed to proceed on the assumption that no one lived in Montague. That galvanised Trisha to start the Montague Community Alliance in 2012. She was determined that Montague people, both residents and businesses, would not be ignored. Small gains have been made. Neighbourhood amenity agreements have been entered into with developers and they have successfully argued for the retention of bluestone laneways. The Montague Community Alliance has partnered with Southbank Local News to put on these forums. Southbank News is a local paper in the old tradition – it covers local issues in depth and gives a voice and space in the paper to local people. All that and a clean, legible design on decent paper. The meetings have moved from the chill of Father Bob’s warehouse in Boundary St to the hospitable Golden Fleece Hotel which is coming back to life in this changing and emerging community – a ‘locals pub supporting local products’. The Montague Forum on Tuesday 20 March began with respectful civility and courteous exchanges between the three parliamentarians. It became more heated as the evening wore on. Samantha Ratnam spoke first, showing an impressieve grasp of planning from her experience as a Councillor and Mayor of the City of Moreland. She was right across the issues in Fishermans Bend. David Davis spoke next, referring to ‘announcements that would be made closer to the election’. He used most of his allocated ten minutes to critique planning decisions made elsewhere by the current government. Avery steered Davis firmly back towards Montague. ‘We’ve been burned by your government’ and all that has flowed from that abrupt re-zoning of Fishermans Bend in 2012 she told Davis. With the new South Melbourne Primary School at Ferrars St up and running, Martin Foley used the occasion to talk about a new secondary school in Fishermans Bend. Drawing on the experience of the primary school where a community of advocates was formed well in advance of construction beginning, he invited people to start working towards a secondary school. He flagged future governance arrangements for Fishermans Bend, a ‘one stop shop’, which would include a strong and continuing role for the Melbourne and Port Phillip Councils but with a continuing community engagement focus. He committed to following the ‘rigorous scrutiny’ of the Fishermans Bend planning panel currently underway. The tram crossing? Everyone agrees that public transport into Fishermans Bend is key – it is just the tricky matter of its alignment. Once again, the recommendation of the Panel on this matter will be accepted. In spite of several invitations from the audience, Davis refused to commit to accepting the Fishermans Bend Planning Panel recommendations. He returned again and again to his theme, that the present government was not to be trusted, that they ride rough shod over communities in planning matters and that announcements would be made closer to the election date. In future planning for Fishermans Bend, Ms Ratnam said she would like to see a more empowered City of Port Phillip and the return of third party appeal rights. On the basis of her experience in Moreland, she would like to see mandatory rather than discretionary planning controls. Meanwhile the matters that have preoccupied and frustrated community members since the re-zoning in 2012 were aired (yet) again but couldn’t be satisfactorily answered. Now they have been joined by residents from the newly completed Gravity Tower. When will funding for the public transport, especially the tram be announced? How will the infrastructure that everyone agrees is needed be paid for? How will the employment, on which so much emphasis is placed in the draft Framework, be assured? 1Martin Foley is Mintister for Housing, Disability and Ageing, Creative Industries, Equality, and Mental Health.